In the early morning of 31 July 1972, the British army initiated Operation Motorman in response to Bloody Friday, a series of bombs that occurred days earlier in Belfast. Their goal was to re-take control of ‘no-go’ areas in Irish nationalist communities and dismantle the barricades. Operation Motorman involved appox 21,000 troops and would be the biggest military operation in Ireland since the Irish War of Independence. Barricades became a common sight during the troubles. They had been built in several communities across Northern Ireland in response to sectarian attacks. Irish nationalists built barricades to protect their communities from attacks by loyalists mobs and the RUC. The most iconic ‘no-go’ area was in the city of Derry and it was named Free Derry. When police attacked the Bogside community in January 1969 the words “You Are Now Entering Free Derry” appeared on a gable wall of house. In April of the same year, the police force entered a house on William street and best the occupants who were unarmed civillians. One of the occupants was Sammy Devenny, a 42-year-old, who was so badly beaten that he died from injuries. Sammy became known as the first victim of the troubles. In response to the ongoing attacks from the police force the Derry Citizens’ Defence Association was formed. They became the self-declared government of Free Derry and help coordinate the residents during the battle of the Bogside. Other barricades across Northern Ireland strengthened in response to several policies of the British Government such Operation Demetrius and Bloody Sunday. 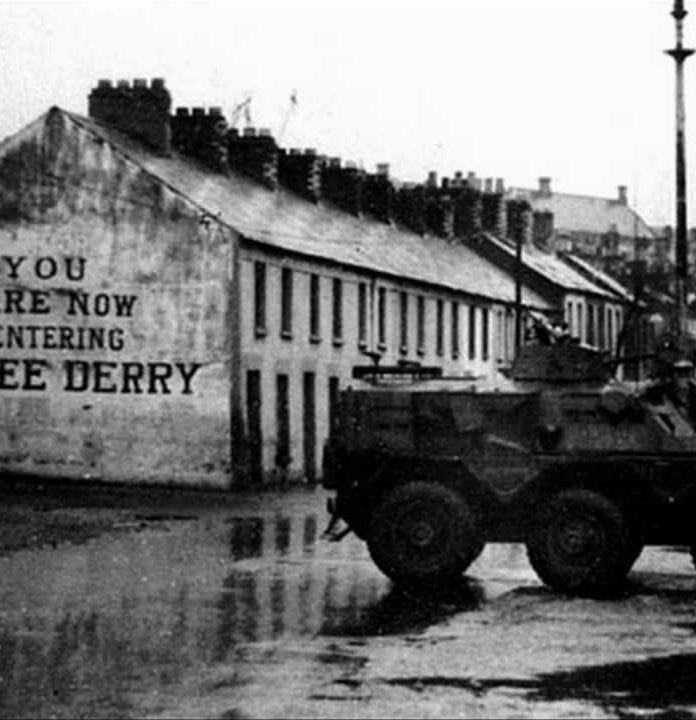 The no-go area of Derry resulted 29 barricades, many of which were impregnable by heavy military vehicles. 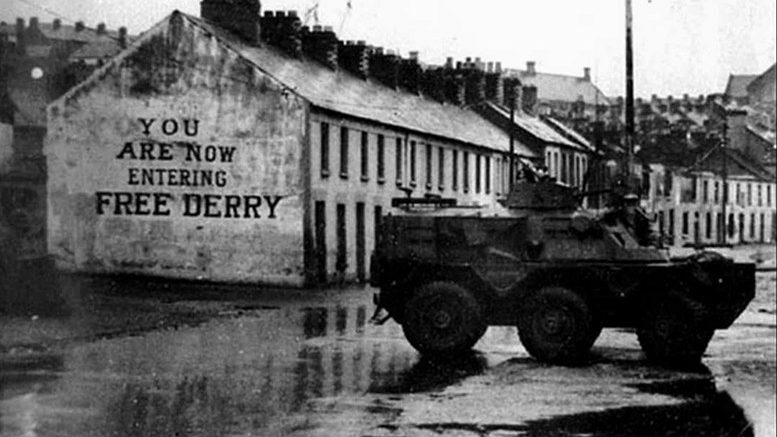 British troops started preparations to enter no-go areas of Belfast, Derry, Newry, Armagh, Lurgan, and Coalisland. The focus was on Derry (codenamed Carcan) with the aim to dismantle the IRA in the largest no-go areas of the Bogside and Creggan. British forces started preparation of Operation Motorman by drafting in an extra 4,000 troops bringing an estimated total of 21,000 troops that included 27 infantries and two armored battalions. Under the cover of darkness HMS Fearless came close to shore and unloaded Centurion tanks adapted as bulldozers. On July 30th a “ring of steel” was raised around Derry by the army who setup checkpoints on most roads coming in/out of the city. They’d also sent foot patrols into the Bogside side area to show their strength. The Official and Provisional IRA were also preparing for Operation Motorman. They were forewarned of the plans and decided beforehand to withdraw from the no-go areas. Not only were they outnumbered and outgunned, they believed the British forces would be reckless towards civilians within the community. At 4am on 31 July the army moved into the ‘no-go’ areas across Northern Ireland and proceeded to take down the barricades. The specially adapted Centurion tanks pushed the rubble off the roads allowing the smaller vehicles to pass. Due to the sheer size of the operation it was over within a matter of hours but in Derry, four people had been shot and two them were dead. Daniel Hegarty (15) left his house to watch the Centurion tanks roll down the street towards the barricades followed by squads of Royal Marines and engineers. He was shot twice in the head at point blank range, his cousin Christopher (16), suffered a bullet wound to the head but survived. In 2011 an inquest jury found Daniel posed no risk and was shot without warning. He was shot within 10ft, although the solider claimed he pulled the trigger by accident as it sat on the ground. In March 2016 it was decided not pursue charges against the solider and is now currently under review at the High Court. The second killing was of Seamus Bradley (19), an unarmed member of the IRA. Bradley was shot 5 times by a solider. The British solider claimed Bradley was running and climbed a tree armed with a gun. The soldier claimed he shot into the tree and Bradley fell down sustaining additional injuries as he fell. Transferred to an army post beside St John’s school he died from his injuries. A recent inquest discovered Bradley may have been stripped and shot before he died in captivity. A Coroners’ Court approved a new independent ballistics experts report. It suggested Seamus was running away and unarmed when he was shot numerous times in the back. There was no suggestion he was shot out of the tree. The British seen Operation Motorman as a success. However, it made the nationalist community even more distrusting of the government and the security forces. To this day, the gable wall of Free Derry corner still stands in the Bogside – a monument for Civil Rights.